“PrisonStorm” has grown to become perhaps the most progressive Twitter open debate on the state of the prisons in England and Wales. To coincide with the launch of Injustice, we interviewed one of the founders, Joe Spear. Injustice: Why did you decide to set up Prison Storm? PrisonStorm: Back in October 2016, I was one of two people sat around a table debating prisons. Opinion on a whole range of issues was little short of astonishing. Then a thought struck us; how many other people are asking the same sorts of questions? A decision was taken to find out and to try to find a way of arranging a debate on the subject. My first thoughts were to organise some actual meet-ups and use social media as a way of inviting people. Then I realised we would be doubling the work. Why not hold the debate on social media itself. It was decided to use Twitter and to try to create a “twitter storm” about the state of the prisons in England and Wales. The concept of PrisonStorm was born. Injustice: What is the purpose behind Prison Storm? PrisonStorm: PrisonStorm endeavours to do three main things: inform change, facilitate change, and assist those who want to be change makers. In each of those three respects, it is really an initiative that is “for the people by the people”. It is designed to debate the tough topics. This means it lets people have their say, air views, discuss issues they see as important, understand what differences of opinion exist and, as importantly, to ask questions and find answers. The community of followers and participants is growing and today comprises people who have served custodial sentences, families of those presently in custody, prison governors, prison officers, policy makers, practitioners, lawyers, academics, think tanks, charities, authors and bloggers, and activists for prison reform. In addition, some members of Parliament and some Police and Crime Commissioners follow the work of PrisonStorm. PrisonStorm hopes to effectuate meaningful change that perhaps could not be achieved by other more conventional routes. In practical terms, PrisonStorm has worked hard to earn trust and a good reputation for unbiased sharing and comment. That is not to say PrisonStorm hasn’t got its critics. Injustice: What sort of response has there been from people? PrisonStorm: PrisonStorm began in November 2016 with two founders and a core of twenty people who had expressed an interest. Whereas most of those continue today, a few have moved on for their own reasons, we’ll always be grateful for their support in the early days of PrisonStorm. PrisonStorm ran its first open debate on Sunday 13 November 2016 and, from a standing start, saw the hashtag #PrisonStorm trending on Twitter within its first 60 minutes. 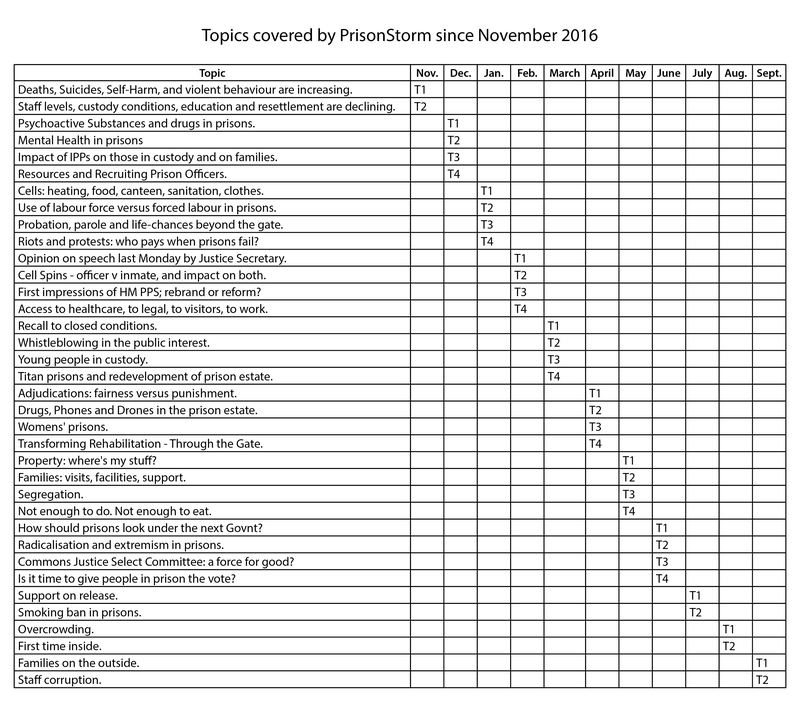 PrisonStorm ran its second open debate on Sunday 4 December 2016 and, once again, saw the hashtag #PrisonStorm trending on Twitter, such was the level of interest and engagement on the four topics being discussed. Feedback from participants of the first and second open debates was beyond expectations. It had struck a chord. I think the first act of learning is listening. It was important to start by listening to how people really think and feel about prisons. It is a very emotive subject because the impact is very deep for those people placed in custody and for their other halves, their family and their friends. Equally, the impact is felt by those responsible for custody, for probation or for parole decisions. PrisonStorm has run an open debate on Twitter every month, so far covering thirty six different topics. Learning from what people contribute during an open debate enables a distillation of opinion, which is like a snapshot of how people really feel and think. It is important to remember that PrisonStorm is a relatively new concept so we try out different things to see what works. For example, on Thursday 8th June, PrisonStorm held an “Election Night Special” which started at 10pm, after polls closed. Four topics were debated across a very intensive two hours. For the summer, we started Twitter polls to invite people to vote on which topics they wanted to debate next. This generated a significant rise in interest, engagement and participation. Injustice: How do you think the general public understands (or not) the prison system? PrisonStorm: I have to say the answer is mixed, depending on who you ask. On the one hand, there is some “blissful ignorance” of what is really happening behind the wall of our prisons. This is prevalent because the general public don’t wish to know. Society expects punishment to be given to those in society who break the law. On the face of it, that sounds entirely reasonable, yet in very many cases the general public looks for a harshness of punishment that leaves no room for any sort of rehabilitative process. This “lock ‘em up and throw away the key” approach may carry some short-term personal satisfaction for those looking for retribution dressed as justice. But the vast majority of people who are sent to prison will, at some time, be released back into society. Suddenly the short-termism has to be balanced with what benefit longer-term is realised by society when individuals are released from custody without having learned a ways of living other than by committing crime. You only have to look at the re-offending rates and draw your own conclusions. On the other hand, there are those who are very well informed about the prison system. Quite often, this is purely because someone they know is currently in, or has been in, the system. The lessons these people learn are frequently deep and are laced with a sense of helplessness. Whereas some people successfully convert that into attitudes and behaviours that go on to foster change, many more don’t make that leap. Or for a variety of reasons, cannot. The option “no reaction at all” polling 48 percent of the final votes will either seem comforting or scandalous to you, depending on which side of the debate you currently stand yourself. Only today a person I sat near to, who claimed to be 75 years old, was heard to say out loud that they thought hanging should be brought back. Is that what change makers are up against, I asked myself? Injustice: What responsibility do you think the media has for the problems of crime and punishment? PrisonStorm: With the notable exceptions of media who embellish and sensationalise the problems our prisons suffer, blame for the problems of crime and punishment cannot be attributed to editors and journalists. On the contrary, press scrutiny of prisons is a very rare and precious commodity. It is well known that the Ministry of Justice routinely denies access to the prison estate even for accredited members of the press. On balance, broadcast media does the general public a great service by producing documentaries that expose the state of prison establishments, for example the BBC Panorama programmes featuring footage taken on hidden cameras by immensely courageous whistleblowers. Similarly, independent production of films which accurately reveal what is happening from different angles is important work in helping to inform the public. Journalists have a vital role to play in putting on the public record what happens in prisons, even difficult things such as deaths in custody. I’ve seen this done really badly and I seen this done really well. Injustice: Does PrisonStorm advocate prison reform? If so, what? PrisonStorm: The PrisonStorm agenda is the pursuit of positive change. The word “reform” is a much misunderstood word these days. You could argue that measures such as those brought in by Chris Grayling when he was Justice Secretary were “reform” but the outcomes are widely regarded to have been far from positive. Positive change necessarily has to improve things. Changes can be positive in multiple small ways, so we look to understand what those are and during our open debates we frequently tweet ask for suggestions on what positive actionable steps could be taken. The worse the prisons get, the more notice is taken of those who call for “reform”. For example, have you noticed how television, radio and press are inviting comment from people with experience of prisons who are calling for change? If I was only allowed one change, it would have to be to open all our prisons to the communities in which they are located. That one change – allowing residents, businesses, journalists, councils, police and crime commissioners, MPs and others to come and see for themselves the conditions – would bring about all other changes that need to be made. Such will be the swell of public opinion and engagement when the real situation of what our prison service has become is seen and understood. The under-staffing, the over-population, the inhumanity, the violence, the drugs, the hopelessness – and yes, also the great things done by heroic people working against the odds – everything revealed. Right now, far too much is hidden beyond sight. Far too much is out of earshot. Far too much is covered up. Injustice: What are the political difficulties in trying to reform prisons and criminal justice? PrisonStorm: The political difficulties regarding “reforming” prisons and the criminal justice system are many and varied. One commonality we observe from feedback to us and from reading about the sector is the paralysis of doing nothing at a political level. Of course, there are reviews, reports and investigations being run all the time. But all that activity, at taxpayers’ expense, all too frequently results in nothing being done that brings a tangible positive improvement. The idiom of “two steps forward, one step back” characterise what we see. A second commonality would be frustration caused over the “selective hearing” by those who hold political roles and compounded by apparent lack of responsiveness. Although busy constituency MPs in their own right, Ministers and Shadow Ministers would be well advised to do something about not replying to very reasonable requests put to them. I believe in the democratic process and don’t think there is anything to be gained in subverting that process. We watch all relevant debates held in Parliament, the House of Lords and the House of Commons, and also follow relevant committees. Select Committees on Justice, on Human Rights, on Home Affairs and on Public Accounts all matter politically. Injustice: Do you feel that politicians are unwilling or unable to reform? PrisonStorm: I would have to say both; there is a real lack of willingness as well as an inability to bring about “reform”. The unwillingness to reform stems from MPs own command presence; whilst some people would argue they are all “divas at heart” if they feel like they have poor job security it will only mean they will be tempted to spend more time watching their back than on the job at hand. The inability to reform stems from not straying from party lines. I’m told Party whips are not people you disregard lightly if you have an eye on your career. Too often, I think politicians regard prisons and prisoners as not “vote winners”. Is that why little gets done to change things? But PrisonStorm is not here to level criticism at the people, per se. PrisonStorm is here to critique the policies they come up with. Perhaps it is more constructive to de-personalise the arguments and focus on the issues that confront us all? Injustice: What do you think the future holds for prisoners and reform? PrisonStorm: If collectively we can find a way to confront the brutal facts of the current situation and maintain unwavering belief that we will see breakthroughs then I think the long term looks bright for prisons and for the criminal justice system. Right now, however, have to agree with those who say that prisons are a humanitarian issue and the criminal justice system has deviated from true justice. A programme to build big prisons on industrial estates away from any local community perpetuates the belief that policy is creating a so-called “prison industrial complex”, or put another way, the warehousing of people in custody. Whilst many prisons very clearly are in desperate need of modernisation, mega “Titan” prisons are yet to prove their value in terms of the end goal, which is safe custody, education and new skills leading to change of mind and a new life on release from prison. The most effective prison is the one that doesn’t need to be built. Injustice: Last question. How do people get involved in PrisonStorm? PrisonStorm: Everyone is welcome to PrisonStorm. To join a PrisonStorm open debate simply follow the PrisonStorm account and add the hashtag #PrisonStorm to your tweets. This helps other people find, reply and share your content during the debate and afterwards. The next PrisonStorm open debate will be in October 2017. Please watch @PrisonStorm for announcements. Previous An anatomy of a prison smear, or never, ever trust a journalist… Or the news.